Great for screen repairing, light upholstery work, arts and crafts projects and scores of other light duty household tacking chores. 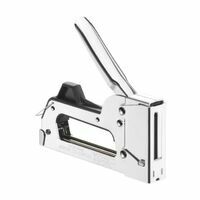 Comfortable soft grip and handle, easy squeeze mechanism, built-in stapler remover, large reload window on bottom of stapler. Perfect for everyday stapling needs around the home or office. Lightweight with convenient handle lock. Quick clear mechanism. Chrome plated steel construction. Uses 1/4" and 5/16" light duty staples. All steel construction with a chrome finish, contoured handle, plastic stop, jam proof mechanism and visual refill window. Used in applications such as displays, silk screens, light upholstery, crafts and posters. Load full strip of (100) ARROW staples of .030 wire in sizes 1/4", 5/16" and 3/8" staples. Visual refill window. Perfect for screen repairing, light upholstery work, kitchen shelf trimming, closet lining, cornice covering and scores of other light duty household tacking chores. No. JT21M : All steel construction. Jam-proof mechanism. Hand-contoured handle. Built-in staple lifter. Household baked enamel finish. No. JT21CM: Durable hi-impact molded plastic housing. Safety handle lock. All steel channel and track for non-wearing, jam-proof performance. Easy to squeeze design - female can squeeze with one hand; comfortable ergonomic grip, precise; user friendly forward action design; compact for easy storage; ideal for projects around the home: home decor, decorating, quick repairs around the house, crafting and hobby projects; uses "JT21" staples in three sizes up to 3/8" (10mm). Chrome plated steel construction for durability; soft rubber grip handle; bottom loading magazine saves time and hassle; visual refill window shows the user if they have staples loaded; uses T50 stples: 1/4" (6mm - sku #s - 611.7238, 187.2142); 5/16" (8mm - sku #s - 584.6472, 509.4974); 3/8" (10mm - sku # 962.6045); 1/2" (12mm - sku #s 192.8522, 060.7077); 17/32" (13mm) and 9/16" (14mm); designed in USA. Use for everyday stapling needs around the home or office. Lightweight with convenient handle lock for safe storage, quick jam clear mechanism saves time and hassle, chrome plated steel construction for durability. Use any brand or size of heavy duty staples. A unique black painted All in 1 staple gun. Easy drop in staple loading. Viewing window lets you know if you need to load staples. Use with: Surebonder #4, #5, #6, #11 heavy duty staples or Arrow T50, Powerfast, Stanley, Duo-Fast, Bostitch, Craftsman, Master Mechanic, Do-it, Ace Hardware, Black & Decker and Unifix staples. The compact design and precision make it easy to use one-handed, leaving your other hand free to assist in your project, such as holding your fabric taut; powerful; uses T50 staples: 1/4" (skus 611.7238, 187.2142), 5/16" (skus 584.6472, 509.4974), 3/8" (sku 962.6045) and 1/2" (skus 192.8522, 060-7077). All steel construction; high carbon hardened steel working parts. Visual refill window. Patented jam-proof mechanism. Easy double leverage operation. Loads (85) Arrow No. T-50 staples only of .050 wire in 6 sizes; 1/4", 5/16", 3/8", 1/2", 9/16" and Ceiltile from light to heavy duty work. Used by building contractors, home do-it-yourselfers, and speciality trade applicators. Exclusive anti-jam mechanism. Low stroke handle to reduce hand fatigue. High power and penetration. Easy slide full stick staple load. 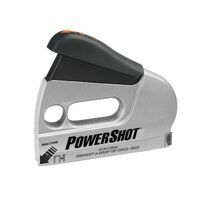 Gives ultimate power with minimal effort; simply squeeze the staple gun handle, position on the work piece and pull the trigger to set the staple; ideal for hard-to-reach areas and accuracy; easy drop in staple loading; adjustable depth drive, fabric/screen gripper; viewing window lets you know if you need to load staples; use Surebonder #4 or Arrow T50 heavy duty staples. Great for wiring projects; compact; powerful; precise; grooved guide ensures consistent stapling; for wires up to 1/4" (6mm) diameter; uses T25 staples (sku #s: 415.8796, 415.8812, 415.8846). Arrow Staple Gun Tacker, Heavy Duty, Steel, Chrome Plated, For Housewrap, Upholstery, Flooring and Screening Easy-squeeze technology helps reduce actuation force; anti-jam magazine prevents jams and misfires; heavy-duty stapling mechanism for durability; surface guard to prevent damage to underlayment material; ergonomic design is weighted forward for comfortable use; uses Dewalt Heavy Duty Staples series DWHTTH700 available sizes 5/16" (8mm), 3/8" (10mm), 1/2" (12mm), also uses same range of Stanley TRA700 series Heavy Duty Staples plus Arrow T-50 Heavy Duty Staples. Arrow Stapler and Wire Tacker, Dual Purpose, 1/4 in Staple Durable tool can drive five types of fasteners, giving you the ability to take on a range of jobs. High/low power switch provides increased flexibility for a wide array of applications. Integrated wire guide makes fastening cable and wire quick and easy. Interchangeable belt clip fits on belts and pockets of both left and right-handed users. Lightweight die-cast aluminum housing design for durability. Uses DEWALT heavy-duty staples (DWHTTA700 series), Stanley (TRA700 series sku #s: 244.4123, 942.1983, 224.2592, 698.8323 and 083.6304) or Arrow T50 heavy-duty staples up to 9/16 in. (14 mm) in length; uses Stanley 18-gauge brads up to 5/8 in. (16 mm) in length; uses Stanley round crown staples (CT100 series) or Arrow T25 series up to 9/16 in. (14 mm) in length; uses Stanley light duty staples (TRA200 series) or Arrow JT21 series up to 3/8 in. (10 mm) in length; uses Stanley flat narrow crown staples (CT200 series) or Arrow T20 series up to 9/16 in. (14 mm) in length. Fires narrow crown staples. Made of die cast Aluminum with a easy to use high/low power setting and the ability to drive 18 gauge brad nails up to 1" in size and staples 1/4" to 9/16". Features an ergonomic grip, quick bottom load, shot meter and resists jams. Used in applications such as insulation, woodworking, upholstery, general repairs, screening, trim/molding, roofing, housewrap, flooring and picture framing. 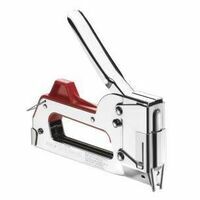 Easy squeeze staple gun operates as a staple gun, nailer, cable tacker and screen/canvas specialty tool. Built-in, retractable wire guide. Handle locks down for storage. Super soft slip-resistant grip for extreme comfort. Dual power lever (Hi/Lo) for hard and soft materials. Ergonomically-designed. Uses Brads: 1/2", 5/8"; Uses Staples: Stanley Sharp Shooter TRA 700 Series or Arrow T-50 Staples - 1/4", 5/16", 3/8", 1/2", 9/16". For wires up to 1/4" diameter. Specifically designed for safe, fast and efficient low voltage wire fastening. Tapered striking edge gets into close corners. Grooved guide positions wire for proper staple envelopment. Grooved driving blade halts staple at right height to prevent wire damage. Round crown staple fits snugly around wire. Widely used in telephone, electrical, electronics and communications fields. All-steel with chrome finish. Loads (85) T25 staples with 1/4" crown-divergent point of .050 wire in 9/32", 3/8", 7/16" and 9/16" leg lengths. Use with: 415.8796, 415.8812 or 415.8846 staples. Boxed. Tacker is lightweight aircraft aluminum housing, comfort soft grip handle with lock and takes both round crown and flat crown staples. Tool is 30 percent easier to squeeze, weighs 1-1/2 lbs., has an anti-jam mechanism, hi/lo power adjustment, built in wire guide, quick drop in loading and a narrow front allows stapling in tight spaces.